Held the morning after another successful FAGAN, the Central Coast 10km was a good way to mentally close out 2018 and open the door on 2019. I was driven to ruminate on the previous 12 months by Robbo’s excellent interview with Celia Sullohern, in which she reflected on her breakout year and touched on some of her philosophy on running. She talked through some moments throughout the year which had driven home the need to (re)discover running for your own reasons rather than for plaudits or the expectations of others. I also took great heart from her desire to relate the convivial nature of recreational running to the often cold, aloof nature of professional athletics. Similar to Celia, I had a good running year – though I only went to the Commonwealth Games to watch rather than race. My training didn’t change appreciably from 2017, other than being a little more consistent. I averaged a shade under 70km per week, with two weeks above 80km (peaking at 82km). I mostly achieved two or three quality sessions each week, rotating through flat intervals, fartlek, and repeats of Tyrrell or Brown St in the aptly named The Hill, but with no cross training to speak of and only some light bodyweight strength work to keep me in condition for work fitness tests. ​I was frankly surprised by my first two races for the year, both in April; a 32 second personal best at the hilly NewRun Half Marathon for 2nd overall behind fellow Flyer Rob Bennett, and a modest 1:57 improvement at one of my favourite runs, the Great Train Race in Melbourne’s Dandenong Ranges. Travelling to Homebush for the Sydney:10 in May with lofty ambitions, I had arguably my worst race ever. Even though I equaled my previous PB, things went pear-shaped in the third kilometre and the result was well short of expectations. Work prevented me from running more local races for the next few months, but I felt back on form after a surprising 3rd place at the Camden Haven King of the Mountain in August. A last minute entry and just a week later it was back to Homebush for the RunNSW Sydney Half. This was a total reversal of my previous visit – unquestionably one of my better races, I turned a huge negative split to knock 5:52 from my NewRun time to finish in 1:13:55, and sneak under my dad’s old bests for the first time at any distance. ​I am still ambivalent about my Melbourne Marathon effort, on an unseasonably warm, humid and windy October morning. The first two hours proceeded more or less metronomically at 3:45min/km pace, but ended in the background of other people’s race photos after collapsing from heat exhaustion in the shadow of the MCG. While I was shattered not to convert a great run into good time, I learned a lot about my physical limits and mental toughness from the failure. My goals for the Central Coast race were to firstly run a PB, and secondly to place on the podium - which I figured needed a low 34-minute time based on performances in previous years. My partner and I got up early for the scenic hour drive down to The Entrance, arriving with plenty of time to pick up my bib and go through the process of warming up. I had a quick reconnoitre of the flat shared path course and pre-race toilet situation, before stretching and enjoying the by-now-tepid filter coffee I’d brought from home. The conditions were mild, I felt good and I was wearing my brother’s Olympic tracksuit - so there was no excuse for a poor run. Even the music at the start line was on point as I lined up at the front amongst a lot of juniors and a couple of other Flyers. The start was fast, with a pack of three or four quickly establishing a gap from the field. I found myself at the front and sat up a little, cognisant that we were all well under 34-minute pace but expecting someone to come past. Passing through the first kilometre in 3:20 and a quick glance back through the corners told me it was just me and another younger male runner as I found my rhythm and chased the lead bike. My aim became to hold 3:24 min/km pace over the bumps in the course in the second kilometre and see how I felt at the turn point just short of 5 km. The half-marathoners had been sent off 45 minutes before us, and the good conditions showed as half a dozen of them went past on their way back to the finish before I got to the turn point. The turn point itself veers onto the grass in a very tight hairpin set up like a cross-country corral. Still feeling comfortable, I tried to power out of the turn, pick up the pace and chase down some half marathoners. By 6km, the elastic back to second place had snapped and by 7km I figured it was just me against the clock. I wasn’t on my own though – there was lots of enthusiastic support from fellow Flyers, the slower runners in the middle and back of the pack, and the local crowd as the course came back toward The Entrance town centre. There is a slightly technical section of the course as it leaves the shared path and reaches the foreshore, but before I knew it I was sprinting over the grass in the finishing chute with a grin on my face. Both my goals were met: an outright win, and having gone easily sub-34 with a net time of 33:21 tearing 3:34 from my previous PB. There were no intermediate timing mats, but my Garmin data points to a 21-second negative split (16:51/16:30), both within a smidge or faster than my 5km PB. ​I hung around waiting for my fellow Flyers to finish the 10km, although I missed most of our half-marathoners while I took a quick cool down run. 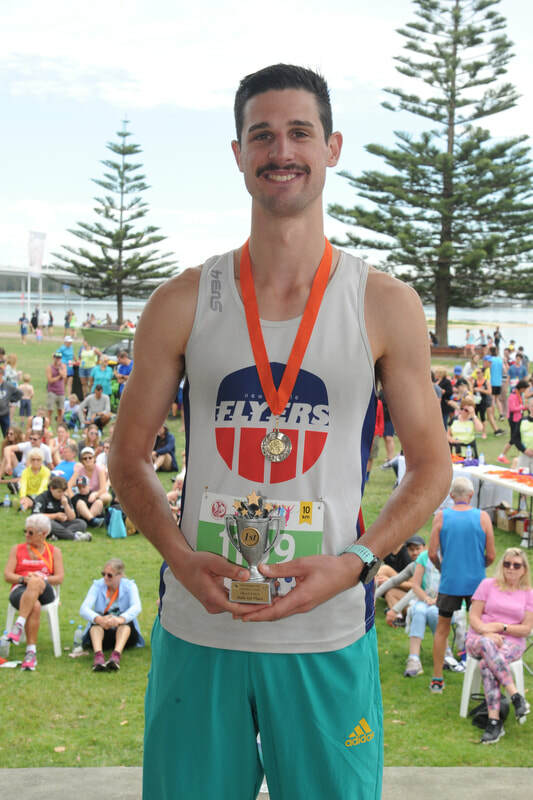 I was lucky that the half-marathon is the showpiece event, as that was even more competitive; however, it was a great race to pick up a first overall win and the cash prize more than covered delicious post-race breakfast in Long Jetty. While it was unexpected to me, the announcer had noticed my tracksuit pre-race and obviously set some expectations of his own. The Central Coast chapter of the Hash House Harriers put on an awesome event, well organised with lots of local community support. ​I hope to be back next year!